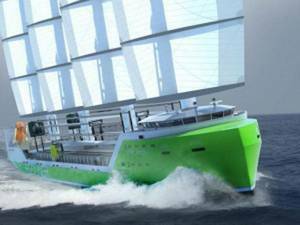 The first Ecoliner design will be a multipurpose ship which can transport all kinds with four Dynarig type (square rigged) masts to power the ship under sail. The sails are fully automatic , operated from the bridge and always produce optimal power at a maximum inclination of 10 degrees. Backup auxiliary power comes from the diesel electric propeller propulsion system with energy generated by the propeller when the Ecoliner is under sail will be returned to the board net and so reduce fuel consumption.